At Niagara Falls the other day we found a smashed penny machine near the visitor’s center that had a movie theater and a food court. I choose the design with the Rainbow Bridge that also said Niagara Falls State Park. Mik was busy eating some rainbow sherbet, so I choose for him. I got him the design with the Nikola Tesla statue. One would think that getting a baseball at Disneyland was as far as my non-baseball sightseeing stops part of the trip collection would go, but it is not. I actually was not surprised to find one at Disneyland, as Mik got me one from there once when he went on a camp trip to California. Finding one at the Maid of the Mist gift shop at Niagara Falls, however, really surprised me. At first Dad thought they only had the tee ball soft ones, but then he picked up one in the basket below an it was a hard regular baseball. While we did not actually go on the Maid of the Mist boat ride I just could not pass up getting this ball for my trip baseball collection. Besides it does still show Niagara Falls. 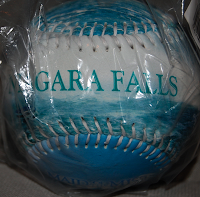 The ball says Niagara Falls on one side. It has a picture image of the bottom of the falls that includes the shoreline and the Maid of the Mist boat near the falls. Another side has a closer view of the Maid of the Mist boat. Opposite that is the Maid of the Mist Since 1846 logo. Parking around PNC Park was not that obvious to find nearby PNC Park. It is not that there is not parking, but rather that some of the most obvious stuff was not really all that close. When Dad dropped me off and went around the block while I got some cash for us to pay for parking, I spotted a small sign that pointed down an alley half a block from the park and we ended up parking there. The parking garage had handicap spots on every floor and several elevators. Even after the game when everybody was using the elevators it only took until the second elevator came to get on one (by the way it does bother us in the parks when able bodied people use the elevators, but we understand using them to go several levels up to your car after a game). Getting into the park was pretty easy. We went in the entrance by the bridge, which only lets you into the river walk area that has basically nothing when they first open two hours before the game. From there it is easy to walk/roll on the concourse to the other river walk entrance where the elevator to where we were seated was located. There are steps down to the elevator area, but there is also a ramp in plain sight next to the steps. Here we waited about 20 minutes for the park to open and access to the elevators be granted. At least going up the elevators was well managed with a person outside the elevator directing people on along with the normal ushers on the elevator. Coming down was a different story and we had to wait for the elevator to go down and back up before we could fit on and even then only one other group (one on crutches) really needed the elevator. It is not that we cannot wait for the elevator, but it was only a short wait because it was a rather low attendance game. It seems that every time there is not an usher outside of the elevator people take advantage of the elevator that do not need it and very few of the ushers inside the elevators seem to car about giving priority to those that actually need the elevator, which is almost always the official policy of the elevators at the ballparks. The elevator situation really was not that bad, but the seating situation was and that is one of the biggest reasons we do not get why this can be the supposed best ballpark in America. Come on how the heck can a ballpark be the best if they do not even have cup holders? At least none of the upper deck around us did besides the handicap row. 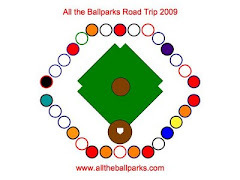 Even the ones in the handicap row were not that great and as you probably know by now one of the main things Mik looks for in rating accessibility and ballparks in general is good cup holders. Worst of all Mik did not even end up with a cup holder because of the lazy usher. We sat in section 305 and when we got to the section we discovered that they have semi-permanent style seats for every spot in the handicap row. Every other two can be unscrewed and moved out of the area so that wheelchairs can roll into the spot. We showed the usher out tickets and he ended up just telling us to put Mik at the end of the row by the stairs to the upper section and sit in the two seats next to him. Mik did not seem to care, so Dad did not put up a fuss to be able to sit where we had tickets for. In the end, though it would have been worth it because Mik ended up feeling crowded when people sort of squeezed by him to get up the steps to their section. Also, Mik ended up with not cup holder, but this was not much of a loss since the ones the handicap row did have did not really fit the large soda cups and Mik would have been more frustrated trying to get it in and out on his own as having to keep asking for us to hand him his drink. The real thing, though, is we should not have had to put up a fuss to have the seats we rightfully paid for. It might have just been this one lazy usher who did not want to have to deal with having the seats removed for it to become wheelchair spots, but I find it unacceptable, especially from supposedly the best ballpark in America. Apparently helpful ushers are not part of being the best ballpark. It worked out okay and we did still at least get a good view of the view and the scoreboard, however, I think if Mik was actually watching the game he would have had trouble seeing the batter because of his spot at the end of the row. Not to mention him being there was probably against fire code. 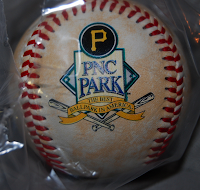 The second baseball I got at PNC Park is one commemorating the 1909 World Series. I thought it was cool to get even though it does not say 100th anniversary. I could not settle for just this one, though, since it says Forbes Field instead of PNC Park, however I decided to get this one along with the PNC Park one since we did after all go to the site of Forbes Field before going to PNC Park. The ball has a Forbes Field 1909 World Series logo on one side and a Pirates P logo on the other side. It also says 1909 World Series Champions.